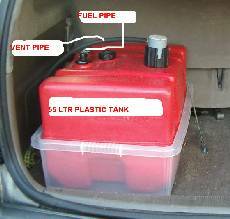 Here is the story of how Alan (The Chipfatflyer) converted a standard diesel powered Japanese people carrier to run on vegetable oil for just £170! This is my personal 2 tank conversion, on a Japanese Import People Carrier. The idea of 2 tanks is to make sure you are not running on cold thick vegetable oil when you first fire up. Putting a strain on the injection pump and injecters this can cause incomplete ignition of the oil in the cylinders. A 2 tank system is ideal for long journeys, not running down the road for a paper. 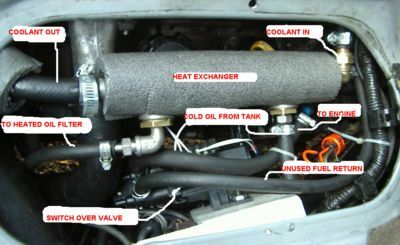 The idea is to get the engine up to running temp, then switch from Diesel to vegetable oil. The vegetable oil then warmed up by hot coolant passing through my Stainless Steel Heat Exchanger and a vegetable Oil Filter Heating Coil (available on ebay). I have been running on 100% vegetable oil since May 2006. Here’s some idea of what I save on a particular regular journey to Newcastle and back around 300miles+. Normally it would cost me around £60 in Diesel. Using vegetable Oil its less than £20. This is using free Waste vegetable Oil and paying 27.1 p tax per litre. I did a lot of web surfing and different designs to make every thing fit in a very confined space. My engine is under the front seats, which is very restricting against a front engined conventional car with plenty of under bonnet space. You will find a lot of ideas from different bodies relating to the use of vegetable oil it can be conflicting sometimes, but my system and design works for me. Any queries regarding my heat exchangers or other related questions, please email me at susan.parr4@ntlworld.com. My Stainless Steel Heat Exchangers are available for around £30 on eBay. Click the link to find out more and purchase. Many thanks to Alan The Chipfatflyer for this information. If you have a story like this email it to us and we will consider adding it to the REUK website.